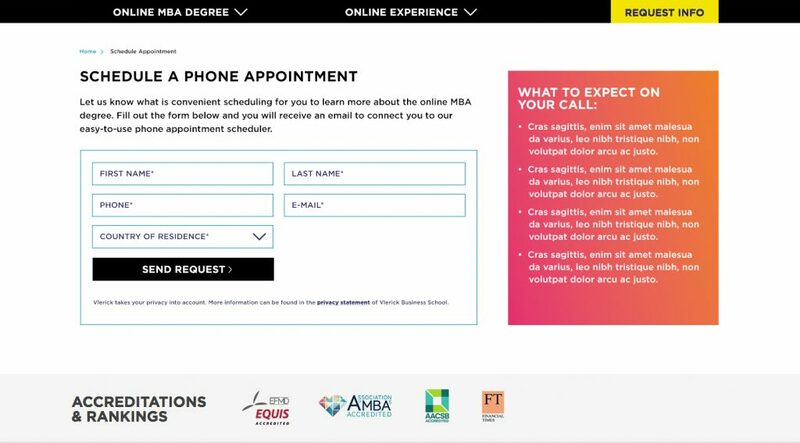 Recently, Vlerick Business School, one of the partners at Wiley Education Services, wanted to increase phone leads. It was asked of me to add a button to the navigation as well as design the experience for the appointment page. We discovered a potential friction-point in the original wording typically used for our appointment scheduler. It’s been historically labeled “SCHEDULE APPOINTMENT.” But worded this way, would potential students question if they needed to visit campus? Possibly. So my first update was to word the button as “SCHEDULE CALL.’ This clarifies what the actual experience will be. Schedule call button added to header. Second, the brand manager offered that she was open to options on how to best lay out the form and page. We kept the amount of form fields to a minimum to promote more potential students filling out the form. Schedule appointment form page example. I always believe that there is time to step back from each project I work on, no matter the size, to be considerate about the best solution, applying UX research when available; if not, reviewing Google Analytics for hiccups in the user path on similar solutions in order to inform the hypothesis and solution. I look forward to seeing data on this particular solution when it becomes available. Hey Buddy!, I found this information for you: "Appointment Scheduler". Here is the website link: https://shemakesart.com/wp/appointment-scheduler/. Thank you.